Having difficulties looking for the right adapter? We can help you because we have all sizes. 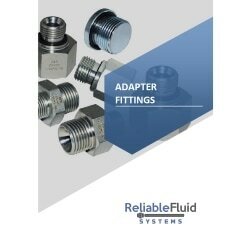 RFS Adapters are used to connect system equipment when no standard solution is possible (for example different threads or size reductions etc.). RFS Adapters mainly consist of steel and stainless steel material and provide instant solutions to ensure no project delays. Design Standard: Various Design Standards. These fittings are used on oil hydraulic systems in many fields (fuel delivery, fuel power application, shipbuilding, mobile hydraulic equipment, etc). A JIC fitting system has three components that make a tubing assembly: fitting, flare nut, and sleeve . Adapter fittings material include carbon steel and stainless steel SS316. Adapter fittings are available between 1/8" to 1 2". Sleeve has two different reading measurements, metric size (mm) and inch outer diameter ("OD). Sleeve size is available from 3mm to 50mm and 1/8" to 2". Fitting sizes are designated by the corresponding outside diameter of the tubing for the various types of tube ends. The standard working pressure of the fittings is up to 420 bar, with different pressures for different sizes and connections. The minimum burst pressure is four times the working pressure.